It’s common for trainers to save the last 10-15 minutes of their session for questions. Sometimes those minutes are more uncomfortable than they are helpful. So, although this may seem like a good way to end the session, there are even better ways to do so. Make your final remark a strong one. Close with a positive quote, story or statement that puts participants in a good mood. The end of a class is the opportunity to hand out evaluations and surveys, so you want your participants to be in a positive mood as they fill it out. The close of a training session is also a great marketing opportunity. 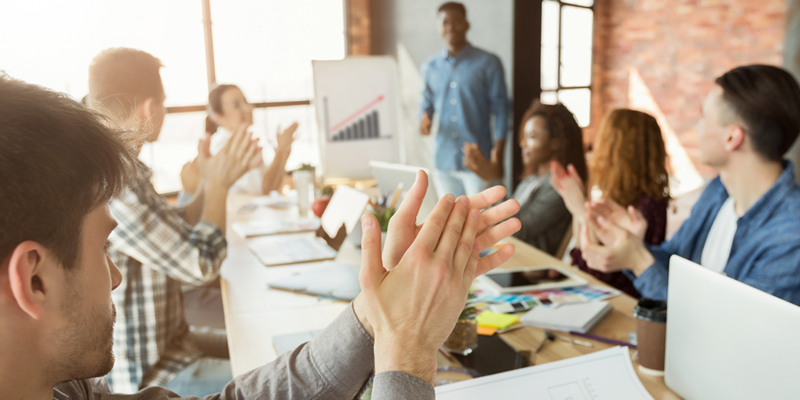 If participants walk out of the room feeling as though their time was well spent, they are more likely to refer your training to peers and supervisors. Remember to circle-back to the objectives to make sure they have been accomplished and incorporate a review. Ask participants to share their most valuable take-aways and if their personal objectives were met. This reinforces relevant skills and knowledge that might not have been familiar by others in the group. Your participants have invested valuable time, energy and other resources into attending your training or presentation. Take the time to celebrate their investments and achievements. Award prizes, hand out certificates or high-five group members – anything that recognizes their hard work during training. Make sure the end of your class includes time for reflection. There is a greater chance that your participants will retain more information and actually apply it if they spend time writing about what they have learned and how they will use it. Action planning is a self-reflective technique that allows participants to think about and consider their key learnings and what their plan is for using them when back on the job. Next time you’re planning your training session remember these 4 powerful ways to end it as strongly as you started it. Not only do you need to know how to end your presentation with impact but the whole session should be meaningful to the learners. Learn how to do so by downloading this FREE training guide: 3 Tips for Making Your Messages Stick.